We signed Henry up for Happy Feet winter soccer this year. Cadence was a little older when we first found the league. She was always the social butterfly and excited to meet new people and try new things, so she dove right in and loved it immediately. The winter league is awesome because it gives the kids an opportunity to run off some of the excess energy that comes from being cooped up in the house in the frigid winter months. And since Henry was finally old enough this year and has been doing so well with his swim lessons, we figured we’d sign him up. We figured it might be hit or miss with H-man. He’s been kicking things around the house since he started walking, and even used to practice soccer moves with Cadence when she was still active in the YMCA league. But he’s also our shy guy–quiet, introverted, slow to warm up to new people and experiences. Technically, his first practice should have been last week, but he was down with the stomach bug. 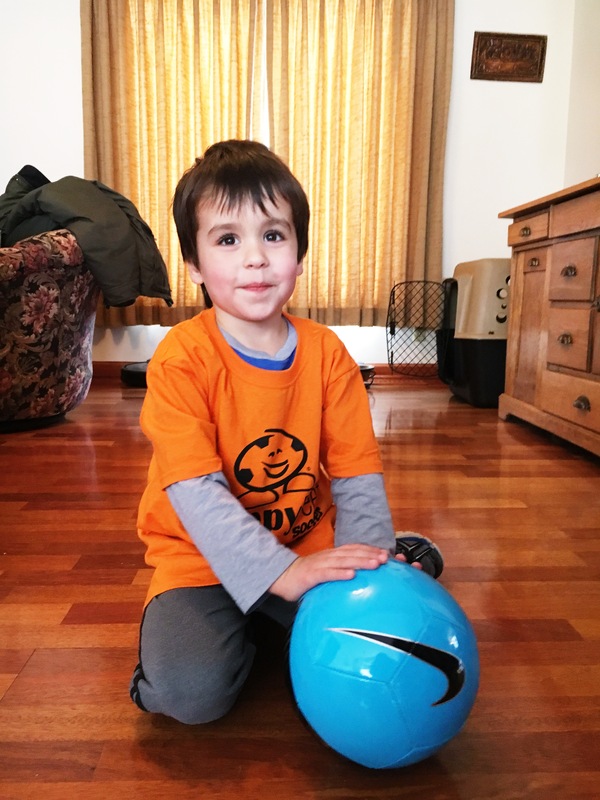 Today, he seemed excited when we got him dressed and grabbed his new soccer ball to head out the door. We were excited to see some kids from school, and Henry was having a blast kicking the ball around with me and Cadence before all the kids arrived and the coaches called the teams together to start practice. Our big mistake today was not getting H-man down for a nap. This dude is a rock star sleeper, and he still needs a little midday nap to keep him sane (to keep all of us sane). He definitely should have had one after being up late and getting so wound up with our dinner guests last night. At one point around midnight, he was talking in his sleep to Beebe. Then, he woke himself up, yelled for Stevie, and demanded a fresh cup of water. We heard him talking and meowing to his stuffed cat for 10 minutes or so before he finally fell back asleep. But no such luck napping today. Henry’s game started at 2:00, and he had about 20 minutes of excitement in him. After that, he spent most of the time walking around the floor in a daze, occasionally kicking at the ball as it rolled by or taking off in a momentary sprint. But he’d get distracted every time the ball left his orbit or one of the other kids tripped and fell down on the floor. He spent half of the game hovering near his coach, occasionally holding her hand as they followed the ball and the crowd of other kids up and down the floor. My favorite moment? When he saw one of his friends fall down and made a beeline over to help. Seeing Henry take the other boy’s hand and call over to tell us his friend was okay…this Momma’s heart melted. I honestly don’t care if Henry kicked that ball or scored a goal today. I don’t care if his team won. If he learned something, if he had fun, if he showed kindness to his teammates and respect to his coaches and opponents–that’s all that really matters. And next week, we’ll see what difference a good nap will make. We had our air conditioner replaced, a sleepless night thanks to Henry’s latest round of teething. Stevie is planning his next trip out to NY to start cleaning out his parents’ house. And I’ve been writing nonstop any free moment I get during the day between Henry’s naps and picking up Miss C from school. I finally got around to uploading the photos from Miss C’s latest game tonight, and had to share. It’s amazing to me how far these kids have come already, after just three games. 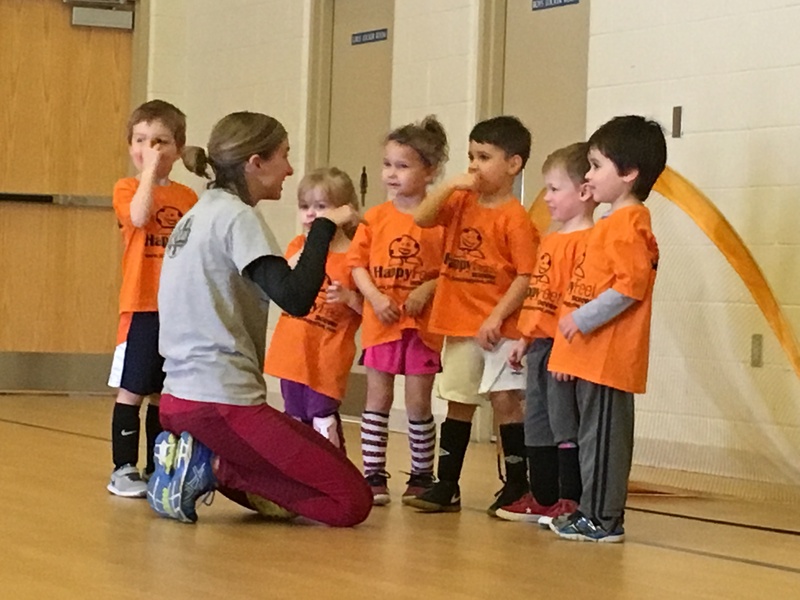 C played the indoor winter league, and that was her first introduction to soccer outside her PE class at school. It’s so much fun watching her and her teammates from the sidelines and seeing them “get” it. Sure, there is still a whole lot of bunching up in a tight group and kicking aimlessly, but as the weeks go on, we’re starting to see the kids spread out, make deliberate passes, and dribble down the field with more finesse. This week, Cadence had a goal, an awesome assist, and several breakaways. 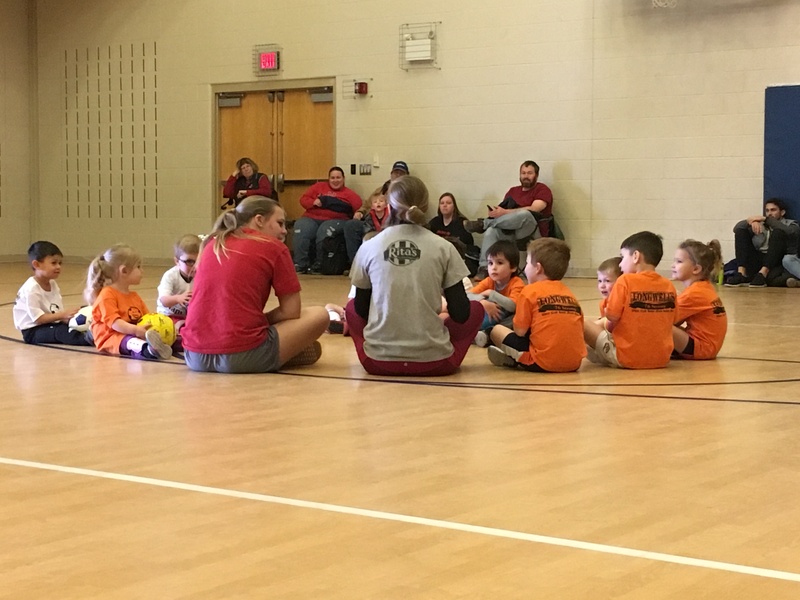 The Chipmunks were totally fired up, and it was awesome to see the kids having so much fun and using the skills they are learning during the game. They played tough–getting back up when they fell down, and shaking off the sting of taking a ball to the face and chest. And best of all, they congratulated each other and came together for a big heartfelt “WE LOVE SOCCER!” cheer in the middle of the field when the game was done. Sports will only get more cutthroat and competitive from here, but if Cadence can continue having as much fun playing them as she did this week, she’ll do all right. Hi, my name is Lori, and I’m a soccer mom. I don’t know how that term ever earned a negative connotation (obviously it was thrown around by people who don’t know how awesome soccer is). Either way, I’m a soccer mom, and I’m proud. Miss C started her spring league today, and it couldn’t have been better. Sunny, 80 degrees, and absolutely beautiful. Cadence played hard and had a couple awesome breakaways, but just couldn’t seen to get the ball in the goal. We’ll work on kicking accuracy later. But for now, we’ll take it. We were proud. Coach Ahmed was proud. And you know Henry was proud (and itching to get out there on the field himself). I was always a really active kid. Through the years, I played softball, basketball, volleyball. I ran track (though I hated running and signed up for events like high jump, long jump, and discus instead). I was on swim team for several years, and practically lived in the pool in the summer. Outside of school, I was always riding my bike or putting miles on my rollerblades. I didn’t compete in sports after my sophomore year in high school though. When it came right down to it, my writing and music ended up trumping athletics, so I put away my jerseys and knee pads and kept busy with band and writing camps and a few different part-time jobs. One sport I always enjoyed watching, but never had the opportunity to play was soccer. In college, I loved heading across the street to the soccer field for home games. And Stevie and I enjoy watching the World Cup every couple years, cheering on the US Men’s and Women’s teams. Cadence had been asking us to play soccer since last spring, but we told her she had to wait until she had a few swimming lessons under her belt. She watched the US Women’s team with enthusiasm, and was thrilled when Grandma Jayne and Papa Duane surprised her with soccer lessons for Christmas. We’ve been counting the days. Just after the new year, Cadence found out that she was going to be on the Cubs team with a few of her friends from school, and this afternoon they had their very first practice and game. C had a BLAST! She played hard and learned a lot. And it seems she has a serious interest in being a goalie (just call her Cadence “Hope Solo” Romano). She was a little bummed that she didn’t score a goal, but she’s already excited for the next practice and has informed me that she wants to play more soccer. I don’t think I ever imagined I’d one day be a Soccer Mom, but after watching my baby girl play today, I think I’m ready to wear that badge proudly.